Deadwood History, Inc. has many items in its collections that tell the fascinating story of Girl Scouts in the Black Hills. 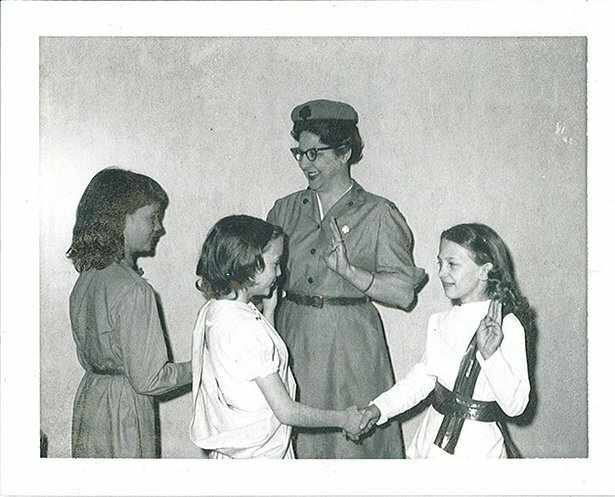 The majority of the materials and artifacts relating to Girl Scouts are in a collection donated by Mary Zantow Bobier who was a lifelong Girl Scout and historian of the Black Hills Girl Scouts. She joined the Girl Scouts as a leader in 1960 and went on to serve as a member of the Black Hills Girl Scouts board. 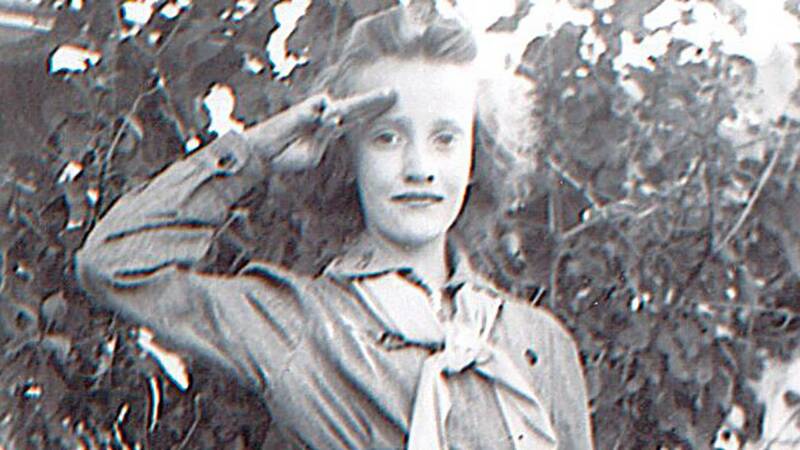 She amassed a collection of uniforms, books, and other memorabilia as well as research she conducted on troops in the Black Hills, all of which is now in the Adams Museum Collection. Mary Zantow Bobier giving Francis Bedsaul the God and Country Award. 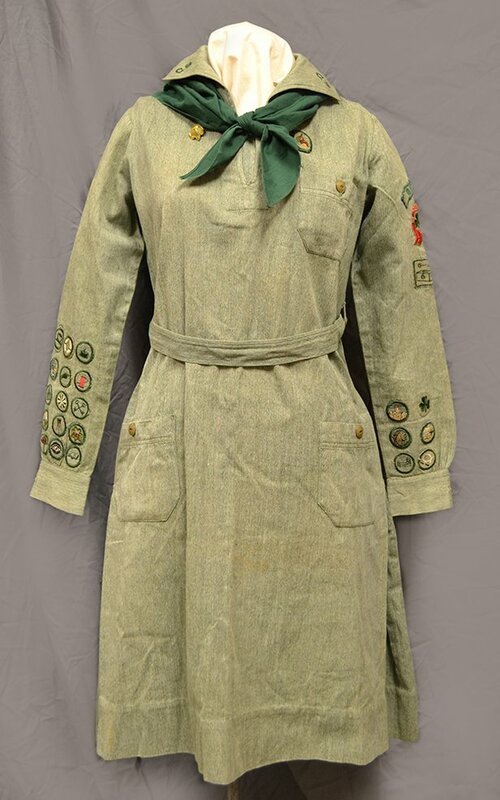 Early unofficial Girl Scout camping uniform worn by Louise Curran. The girls then sold the cookies by the dozen. 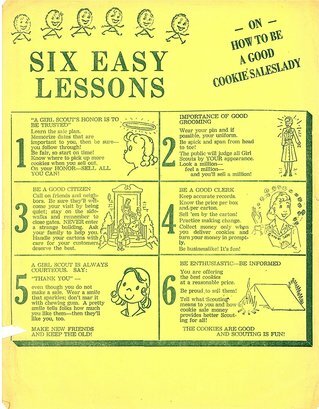 Undated instructions on how to sell cookies. Undated instructions on how to sell cookies. 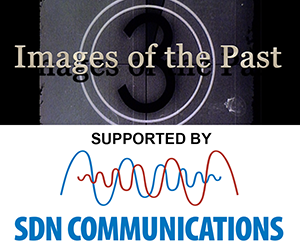 Image Courtesy: Deadwood History, Inc., Yuill/Sundstrom Collection. 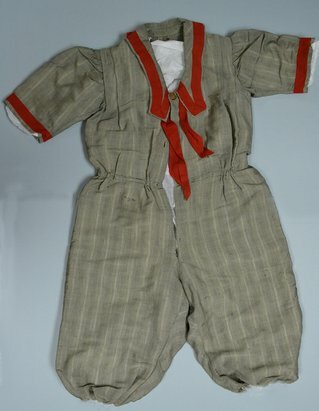 1930s Deadwood #1 uniform worn by Gladys Sellers. 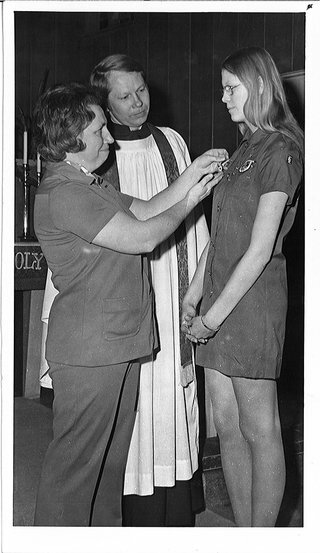 Another important part of Girl Scouting was community service. Rose Gorder told Tammi Oliver in an undated interview that the girls volunteered at hospitals and collected scrap metal during the World Wars. After World War II, the Girl Scouts began a flannel bag program where they made bags out of flannel and stuffed them with crayons, books, and toys for children in Europe who were recovering from the devastations of war. Jeanette Shostrom and Patty Lavier in front of the Montgomery Ward Store in Deadwood, 1942. 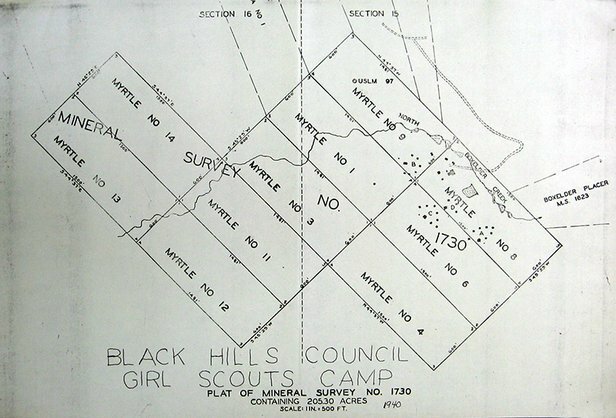 Scouting in the Black Hills grew rapidly through the 1920s and 1930s and in 1935, the Black Hills Girl Scout Council formed. That same year, a rally was held in Lead for the various Black Hills troops; 300 girl scouts and leaders attended. 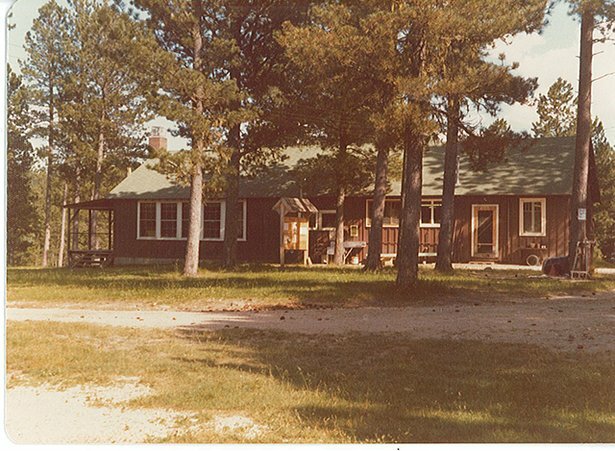 In 1939, the Black Hills Girl Scout Council created a permanent camp for area Girl Scouts. The council formed a committee composed of women from Lead, Deadwood, Rapid City, Belle Fourche, and Spearfish to make this dream a reality. 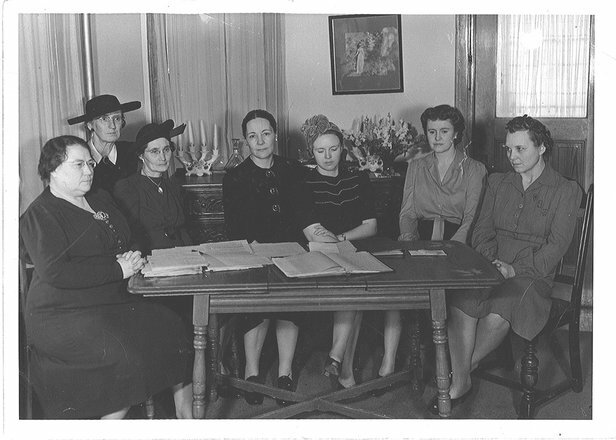 Camp Committee members pictured in 1941 from left to right: Mrs. James O’Hara, Deadwood; Mrs. Web Hill, Rapid City; Agnes McVey, Custer; Mrs. Harlan Walker, Lead; Eleanor Snyder, Belle Fourche; Mrs. R.T. Remschel, Spearfish; Mrs. Walter Vaughn, Spearfish. In 1939, the committee entered into an agreement with the Homestake Mining Company to purchase 205 acres four miles southeast of Roubaix for $300. 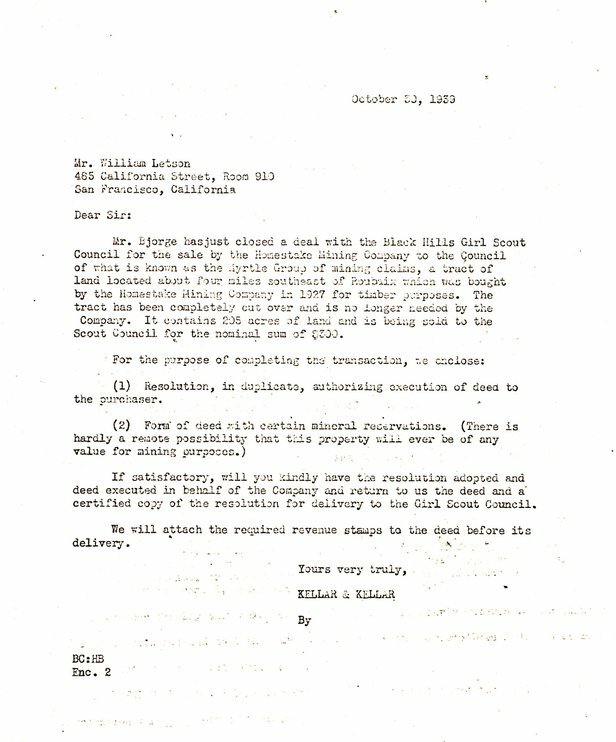 Letter from lawyers Kellar and Kellar to William Letson regarding the sale of land to the Black Hills Girl Scout Council. Mineral Survey No. 1730 of the Girl Scout camp. Undated postcard from Camp Paha Sapa. The number of Girl Scouts in the Black Hills continued to grow and by the 1970s Lead had nine active Girl Scout and Brownie troops and Deadwood had five. The Girl Scouts continue to be active today in Black Hills communities teaching girls the values that Juliette Low held so dear: courage, confidence, and character. Mrs. Don Delicate teaching Wendy Paana, Linda Ross, and Jill Ulmer how people in other cultures greet one another as part of the World Neighbor badge. 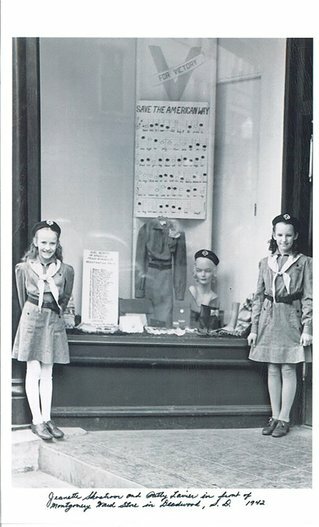 [i] “Juliette Gordon Low,” Girl Scouts, accessed March 28, 2018. https://www.girlscouts.org/en/about-girl-scouts/our-history/juliette-gordon-low.html. [ii] “Girl Scouts will Feast,” Lead Daily Call, May 16, 1918. [iii] “Worthy of Thought,” Lead Daily Call, February 14, 1919. [iv] Gorder, Rose, interview by Tammie Oliver, undated, ARC.2008.118.114, Adams Museum Collection. [v] “Drive for Permanent Black Hills Girl Scout Camp now Under Way” Weekly Pioneer-Times, February 22, 1940. 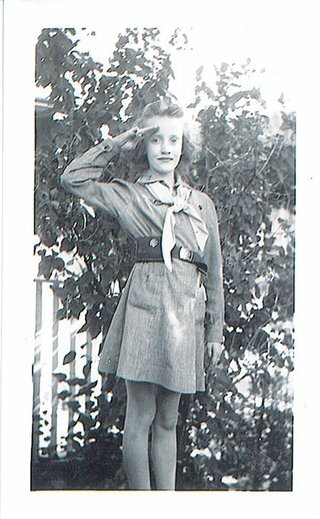 [vi] “89 Are Enrolled At the Girl Scout Camp,” Deadwood Pioneer-Times, July 15, 1941. [vii] Sorenson, Sally, “History of Camp Pahasapa,” Pahasapa Post, June 22-July 3, 1964.